Pure by Andrew Miller is set in Paris in 1785. Jean-Baptiste Baratte, a young, ambitious engineer, arrives at the palace of Versailles hoping to get a Ministerial commission that will help him make a mark on the world. He “dreams of building utopias where the church and its superstitions will be replaced by schools run by men like himself.” Instead, the task he is handed is not one of construction but of demolition. In the Rue de Saint Innocents stands the oldest cemetery in Paris. More than 50,000 victims of bubonic plague were reputedly buried here in one day. The subterranean wall separating the living from the dead has collapsed and the bones and decaying flesh have released a miasma which fouls the air, taints the food and even the breath of those who live within its shadow. It takes a year for Barratte and his team of miners to open the graves and clear away the past. It’s a job which almost costs Baratte his life as the cemetery becomes a kind of hell of burning fires and walls of bones and skulls. Few of those involved in the enterprise emerge unscathed physically or mentally. When they began they imagined they were engaged in a noble cause, building the foundations of a better future in which their endeavours would be marked for posterity. “They will name squares after us ……..the men who purified Paris,” declares the foreman of works. But as the graves are emptied and the cemetery’s wild flowers wither, so the vitality drains out of the workers. Tobacco, alcohol, weekly visits by prostitutes – nothing can distract the team of miners from the sense of loss. ‘I had some good in me once’ one observes bleakly. Baratte too undergoes a transformation. The naïve young man is easy prey when he first arrives in the city. It takes little to persuade him to exchange his sensible brown suit for one of pistachio green silk or to join a group of drunken vandals who move about the city under cover of night painting obscenities about Queen Marie Antoinette. But it is not long before he finds he cannot sleep without a sedative and his ideals and belief in the power of reason are destroyed. It is poisoning the city. Left long enough, it may poison not just local shopkeepers but the king himself. The king and his ministers. It is to be removed. Destroyed. Church and cemetery. The place is to be made sweet again. Use fire, use brimstone. Use whatever you need to get rid of it. 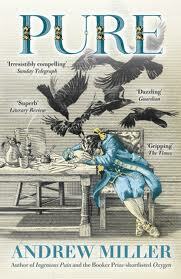 Pure is Andrew Miller’s sixth novel and it won him the 2011 Costa Book of the Year award. The judges praised it as a “structurally and stylistically flawless historical novel.” Miller deftly avoids some of the biggest failings I see in many historical novels – the author’s tendency to want to drown readers in period detail and factual information and then to make their characters speak in a kind of cod ‘period language’. Not so for Miller. He’s clearly done his research but only uses it to bring the characters and location alive through snatches of information about clothes, food and daily domestic life . His descriptions of the stench that pervades the neighbourhood were so powerful I could almost smell it on the page I had in my hands. (rather like my feeling on reading the Paris scenes early on in Patrick Sushkind’s Perfume). In all, for me Pure was a gripping read. Posted on October 13, 2012, in Book Reviews, British authors, Costa prize, historical fiction and tagged Andrew Miller, historical novels. Bookmark the permalink. 10 Comments. This sounds a bit ghoulish but I’m curious to see if my sensation of the setting is as vivid as was yours. Nice review! Let me know what your reaction is Lynn. I hadn’t heard of this before I saw it in my local bookstore and I was instantly intrigued. I haven’t bought it yet but every review I’ve read of it, has been very good so I think I have to get it. I’m not that much into historical fiction either but this one sounds like I would love it! Although need to wash my hands after finished reading…! LOL – yes you certainly do feel a bit itchy and grubby after reading it! This is one on my list that I haven’t yet managed to get round to, but I can see I am going to have to move it up. Last Saturday at the Readers’ Afternoon one of the authors on the panel said that she had had an advance look at is next and she thought it was going to be even better. Unfortunately, she didn’t feel she could say anything more about it, so i can’t say what it’s about.